Motilium (Domperidone Tablets) is used for the short-term treatment in adults of symptoms associated with idiopathic or diabetic gastroparesis (slow moving stomach) as well as intractable nausea and vomiting from any cause. 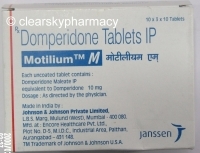 Motilium tablets are manufactured by Johnson & Johnson Private Limited, India in the strengths of 10 mg. You can buy Domperidone 10 mg tablets at a cheap price from our online pharmacy. We also have in stock Ondem Tablets (Generic Zofran) which are used to help stop the nausea (sick feeling) and vomiting, which can take place after certain treatments such as chemotherapy and radiotherapy. They are also used for the prevention and treatment of nausea and vomiting, which can occur after a surgery. 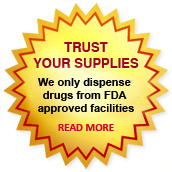 We supply original Motilium tablets manufactured by Johnson & Johnson Private Limited, India. 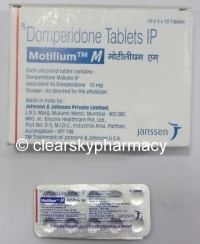 The active ingredient present in Motilium tablets is Domperidone. 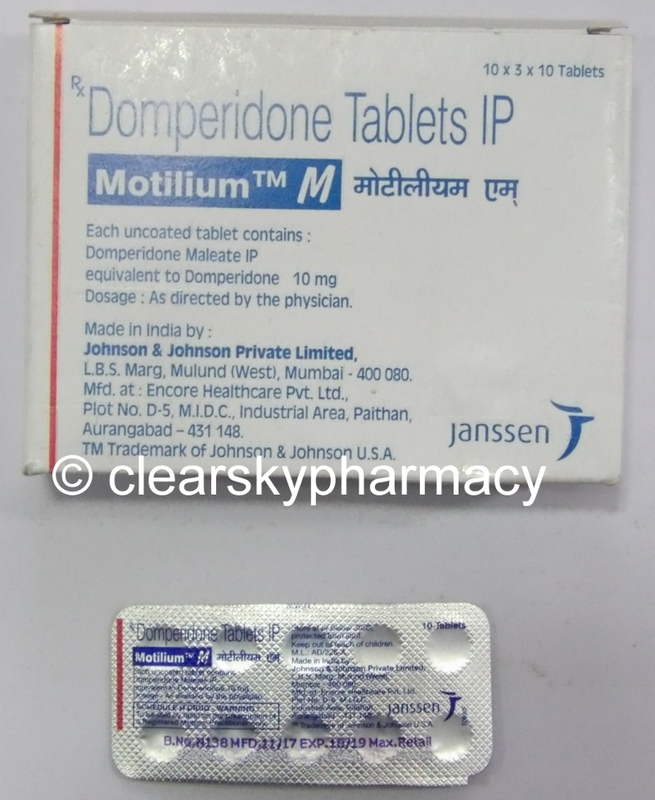 Each Motilium tablet contains 10 mg of Domperidone. 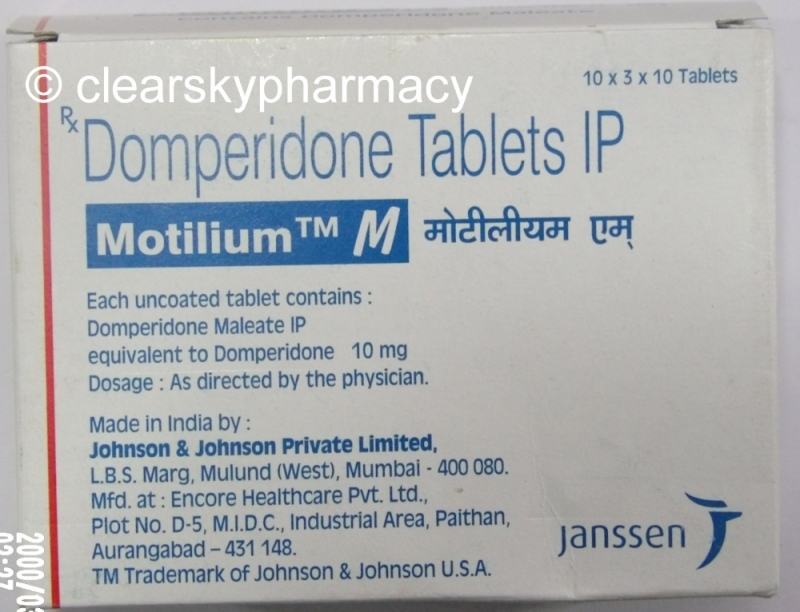 Uses of Domperidone Tablets - What is Motilium used to treat? Motilium (Domperidone tablets) an antiemetic and a prokinetic medicine, is used in adults to treat symptoms of nausea (feeling sick) and vomiting (being sick), a heavy stomach or bloating, a sensation of discomfort in the stomach area or when stomach contents flow back into the gullet, as with belching and heartburn. Motilium doesn't have an inherent anti-diarrhoeal effect and is not used to treat diarrhea. How Does Motilium Tablets Work? Motilium tablets contain 10 mg of the active ingredient Domperidone, which belongs to the group of medicines called dopamine antagonists. It is an antisickness medicine and is also approved to relieve uncomfortable stomach symptoms that sometimes occur after meals in adults, such as stomach bloating, fullness and heartburn. Domperidone works mainly by blocking Dopamine receptors found in the upper end of the digestive system. This causes tightening of the muscles at the entry to the stomach, relaxation of the muscles at the exit of the stomach as well as increased contraction of the muscles in the stomach itself. These actions quicken up the exit of food through the stomach into the intestine, which physically helps prevent vomiting and reduces feelings of sickness, bloating and fullness. It also stops food from flowing the wrong way through the stomach and so prevents reflux (regurgitation of the stomach contents back into the foodpipe). Why Is Motilium Prescription Only? Motilium (Domperidone Tablets) is now available only on prescription, due to a small increased risk of serious side effects on the heart, and consequently patients must first be checked for their risk of cardiac side-effects before taking this medicine. The Healthcare Products Regulatory Agency (MHRA) in the UK has advised that,Domperidone should now only be used for the short-term treatment of sickness and vomiting, and with a lower maximum dose of 30 mg daily. If you faint, or feel like your heart is beating very fast or irregularly while you are taking this medicine, it is important to tell your doctor immediately. The usual dose in adults is one 10 mg tablet three to four times a day, best taken 15 to 30 minutes before meals or food, and if necessary at bedtime. You should not take more than a total of four tablets in a single day. Motilium may be prescribed by your doctor for a maximum of one week for the treatment of acute nausea and vomiting. Do not take any medications that neutralise stomach acid or medicines that reduce the production of stomach acid within 2 hours of taking Motilium because sufficient stomach acid is required to ensure that Motilium is properly absorbed by the body. Motilium is contraindicated in moderate or severe hepatic impairment. Dose modification in mild hepatic impairment is however not needed. Due to the fact that elimination half-life of Domperidone is prolonged in severe renal impairment, on repeated administration, the dosing frequency of Motilium should be reduced to once or twice daily depending on the severity of the impairment, and the dose may be required to be reduced. Such patients on prolonged therapy should be reviewed regularly. Do not increase your dose or take this medicine more often than directed. Your condition will not improve any faster but the risk of side effects will be increased. In case you miss a dose of Motilium tablets take your dose as soon as you remember, and then continue to take it as you would normally. In case it is almost time for your next dose, skip the dose you missed and take your next dose as per your regular dosing schedule. Do not take a double dose to make up for the missed dose. When stimulation of the gastric motility could be harmful e.g in patients with gastro-intestinal haemorrhage, mechanical obstruction or perforation. In patients who have known existing prolongation of cardiac conduction intervals, particularly QTc, patients with significant electrolyte disturbances or underlying cardiac diseases such as congestive heart failure. Cardiovascular Effects: Domperidone has been associated with prolongation of the QT interval on the electrocardiogram. During post-marketing surveillance, there have been very rare cases of QT prolongation and torsades de pointes in patients taking domperidone. Use With Apomorphine: Domperidone is contra-indicated with QT prolonging drugs including apomorphine, unless the benefit of the co-administration with apomorphine outweighs the risks, and only if the recommended precautions for co-administration mentioned in the Apomorphine summary of product characteristics are strictly fulfilled. Use In Infants: Although neurological side effects are rare, the risk of neurological side effects is greater in young children since metabolic functions and the blood-brain barrier are not fully developed in the first months of life. Overdosing may cause extrapyramidal symptoms in children, but other causes should be taken into consideration. Renal Impairment: The elimination half-life of domperidone is prolonged in severe renal impairment. For repeated administration, the dosing frequency of Motilium should be reduced to once or twice daily depending on the severity of the impairment. The dose may also need to be reduced. Excipients: The film-coated tablets contain lactose. Patients with rare hereditary problems of galactose intolerance, the Lapp lactase deficiency or glucose-galactose malabsorption should not take this medicine. Interaction With Other Medicinal Products And Other Forms Of Interaction: The main metabolic pathway of domperidone is through CYP3A4. In vitro data suggest that the concomitant use of drugs that significantly inhibit this enzyme may result in increased plasma levels of domperidone. Concomitant use of the following substances is not recommended: Moderate CYP3A4 inhibitors i.e. diltiazem, verapamil and some macrolides. Caution with bradycardia and hypokalaemia-inducing drugs, as well as with the following macrolides involved in QT-interval prolongation: azithromycin and roxithromycin (clarithromycin is contra-indicated as it is a potent CYP3A4 inhibitor). he above list of substances is representative and not exhaustive. difficulty passing urine or pain when passing urine. Other side effects not mentioned above could also occur in some people. inform your doctor if you notice any other effects. Motilium tablets have no or negligible influence on the ability to drive and use machines. Symptoms of Motilium overdosage could include agitation, altered consciousness, convulsion, disorientation, somnolence and extrapyramidal reactions. There is no specific antidote to Domperidone tablets. In the case of a large overdose, gastric lavage within one hour of ingestion as well as the administration of activated charcoal may be useful. Anticholinergics, antiparkinson drugs may be useful in controlling extrapyramidal reactions. The patient must be observed closely and supportive measures employed. Domperidone has been classified by the US FDA as Pregnancy Category Not classified (Australia Category B2). There are however no adequate and well controlled studies in pregnant women. The potential risk for humans is unknown. Since animal studies are not always predictive of human response and there are limited post-marketing data on the use of domperidone in pregnant women, this medicine should be used during pregnancy only if clearly needed. The amount of Domperidone (Motilium tablets) that could be ingested by an infant through breast milk is very low. It is not known whether this is harmful to the newborn. Therefore breast-feeding is not recommended for women who are taking this medicine. You can buy Motilium tablets online from Clear Sky Pharmacy at a cheap price. Motilium 10 mg pills, manufactured by Johnson & Johnson Private Limited, India are supplied in a blister strip of 10 tablets. The 10 mg tablets cost only $0.25 per unit when you place an order for 500 tablets.